William McGonagall was not blessed with good luck. The son of poor Irish immigrants, he followed his father into the trade of handloom weaver, an occupation that had a certain standing in the community – but the dark satanic mills were beginning to flood out their products and the family travelled around Scotland in search of work, which meant that William had little ‘dominie’ influence. There is some discussion about the poet’s date and place of birth. Some claim 1825 in Ireland; he himself claimed 1830 in Edinburgh. If William’s claim is not true, it is understandable why he might make it: birth in the capital would provide a smoother path through Scotland at that time. The family settled in Dundee in 1836 and the poet would spend the next fifty years in the city of Jute, Jam and Journalism. There never was any Jam in McGonagall’s life – it was always a struggle financially. His first artistic direction was the stage. Performing on the factory floor for his workmates pleased them so much that they raised the money for him to perform speeches from Macbeth in Mr Giles’s Lindsay Street Theatre. A number of such performances followed, often in pubs and clubs around Dundee. During this time he started to carry an umbrella, for he suffered, not so much slings and arrows, but rotten fruit and vegetables directed at him on and off stage – and his umbrella was his only shield. Appearances at Baron Zeigler’s circus and the Transfield circus resulted in such poor crowd behaviour that the Dundee magistrates banned his performances and McGonagall’s appeal, pleading the unfairness of punishing the innocent party, was refused. McGonagall’s treatment was diabolical, but in all his writing there is not a bitter word or comma. Dundee has, so far, never been at the epicentre of epiphanies, but one occurred in June 1877, which was to launch it onto the sea of poetry, giving the city what it has never had before or since – a world famous poet. Sitting in his slum tenement flat, McGonagall heard a voice which said to him, ‘Write! Write!’ Pen in hand, he began to write poetry. 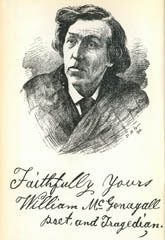 He was to write over 200 poems up to his death in September 1902. His first poem, to his friend the Reverend George Gilfillan, was pushed through the letterbox of Dundee’s Weekly News, signed with only his initials. Since that time his work has never been out of print. McGonagall is sometimes dubbed ‘the world’s worst poet’. This is a title which wannabe poets exhibiting the green glow of their emotional spectrums, or minor academics suffering from NO ONE HAS HEARD OF ME syndrome, have inflicted unfairly on him. History, travel, love, politics, disasters, people both great and humble are all represented in his rich mix of subjects. He wrote over twenty-five battle poems – in Scottish streets, in those days, eye patches, empty sleeves and wooden stumps were common sights. Disasters also made regular appearances in his work. In ‘Women’s Suffrage’ he shows himself to be an early supporter of votes for women: Therefore go on brave women! and never fear/ Although your case may seem dark and drear/ And put your trust in God, for He is strong;/ And ye will gain the parliamentary Franchise before very long. Confident in his work, the poet volunteered his pen as Queen Victoria’s Poet Laureate, but the offer was declined. Should you admire the poet more than her majesty did, you may feel the urge to retrace his famous walk from Dundee to Balmoral Castle. Here is his timetable. Day 1. Dundee June 1878 – early, beautiful day, hat feels light, hot on tramp. Alyth evening 15 miles. Day3. Spittal of Glenshee 10a.m. Balmoral Castle 3p.m. Knock on the door. Now knock on the castle door – it is still there – then say, ‘I am a follower of William McGonagall.’ You never know, you may be luckier than he was! Having gained a minor celebrity status, McGonagall was called on to endorse certain products: from a local tweed manufacturer he received a suit as payment; from Sunlight Soap, 2 guineas. 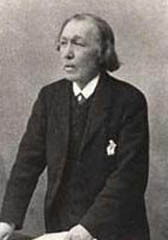 His poem supporting Beecham’s Pills was given national exposure. The company’s advertising budget was around £95,000, but needless to say the poor poet did not get rich on his efforts. His decision to leave Dundee in 1893 is recorded in ‘A New Year’s Resolution to Leave Dundee’: Every morning when I go out/ The ignorant rabble they do shout/ ‘There goes Mad McGonagall’/ In derisive shouts, as loud as they can bawl,/ And lifts stones and snowballs, throws them at me;/ And such actions are shameful to be heard in the City of Dundee. In later life, King Theebow of Burma and the Andaman Islands conferred upon him the honorary title ‘William Topaz McGonagall, Grand Knight of the Holy Order of the White Elephants, Burma’. 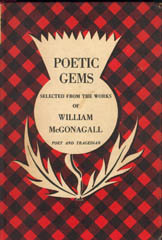 The poet from then on called himself Sir William Topaz McGonagall, G.K.H.O.W.E.B. After a brief sojourn in Perth, he and his family moved to Edinburgh and he became a cult figure in the city. However when he died on 29 September 1902, McGonagall was buried in a pauper’s grave in Greyfriars Churchyard. For the 100th anniversary of his death, the Edinburgh Friends of William McGonagall formed, with the objective of placing a marker in the graveyard. They also hold dinners to raise money for charity. At these events, everything is reversed: coffee and liqueurs are served first, starters last. Sometimes diners are asked to compose four lines in the style of McGonagall – one enthusiast came up with nine pages, with six verses on each. Although the precise location of McGonagall’s last resting place has proved elusive – even the services of a medium did not reveal the actual grave – there is a plaque on the graveyard wall, which was unveiled by the Lord Provosts of Dundee and Edinburgh and two of the poet’s great-great-grandchildren. ‘Poetry in the Garden’ raised money for a second plaque, at the entrance of the stair where the poet died; and on the banks of the river he immortalised, the opening words of ‘The Silvery Tay’ have been cut in stone.